In consideration with the diversity of legal careers and jobs through Europe, Jurismus International now welcomes lawyers up to 40 years old. Download "In consideration with the diversity of legal careers and jobs through Europe, Jurismus International now welcomes lawyers up to 40 years old." 3 A very unique experience will take place in Pamplona in July 2009!! And YOU are more than welcome to join us! The 2009 Jurismus Congress will take place in Olite, a little medieval village within the region of Navarre. Olite is approximately 40 km away from Pamplona, which is the capital of Navarre. 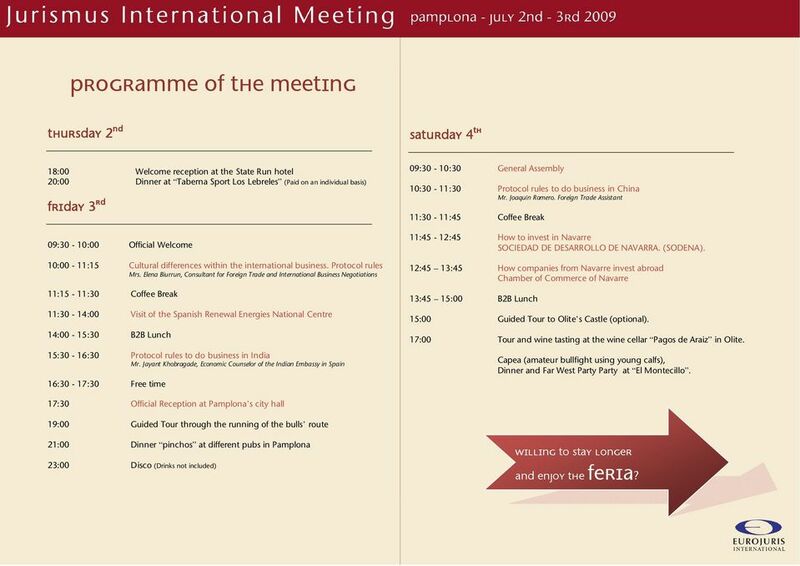 Some of the activities will take place in Pamplona as well. Alex CASTRO ARPA ABOGADOS Learning how to approach and negotiate with foreign entrepreneurs is essential for all those firms with an international interest. Although nowadays there are less borders for people to do business all over the world, not all of them know the tips to make a good impression within the culture they are either approaching or approached by. 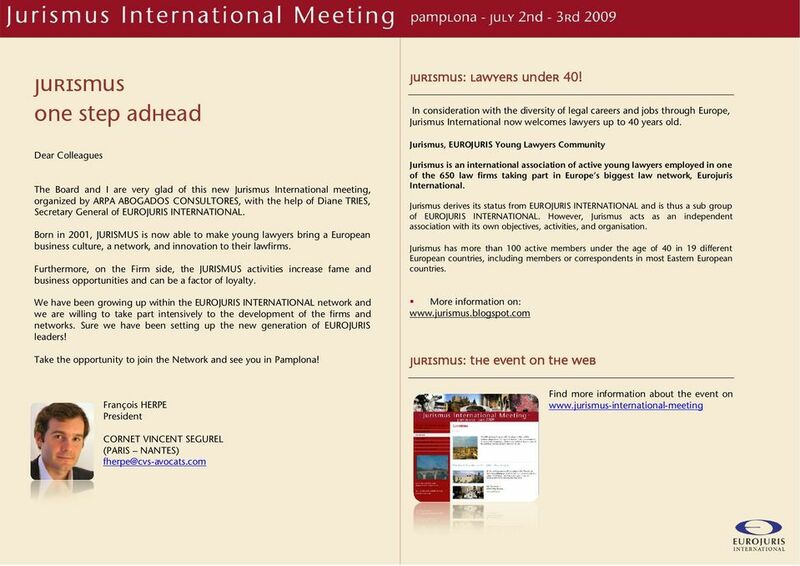 Those tips about protocol within different countries and more so within market leading countries, will be put forward in the JURISMUS INTERNATIONAL MEETING at Pamplona. All the working session will take place in the state run hotel of Olite, which is located in the also called Old Palace. This Palace was built in the 12 th century and it is located nearby the Castle. You will learn the benefits from investing in a Spanish county with the best tax allowances in the country. The congress will take place in Navarre which is a Spanish county that keeps their own tax legislation among other advantages, which makes it quite attractive for foreign companies to invest. You will have the chance to find out how the regions entrepreneurs invest in your country as well as the opportunity to offer your assistance for their business abroad. The NATIONAL RENEWABLE ENERGIES CENTRE (CENER) will open its doors only for JURISMUSSERS, you will discover what the novelties in such industry are and will have the chance to offer your collaboration to CENERs lawyers for future projects. And DO NOT miss the SAN FERMIN FESTIVAL!!! A once in a lifetime experience accompanied by locals!!! Accommodation and Congress will be located in Olite a nearby medieval village. COME ALONG!!! BE QUICK! First come first served!! Alex CASTRO In order to facilitate the attendee s arrival to Olite, there are 4 airports available where they can fly to: Pamplona Bilbao Biarritz Zaragoza It is advisable to fly to the first two airports and this is because such airports offer more connection flights, and they are also the closest ones. Upon arrival, attendees will be picked up and taken to their hotel. Depending on their flights schedule they will be picked up either by bus, microbus, car In order to save the attendees money, transport will be arranged for all of them from and to the airports, at the only cost of 65 per attendee. 6 !" # $! % & '('(()!"!!! !# " $%&& *+,-./0& '('(() '( ) * " +)+!,&& *+,-1/,-0& '('(()!- ". !#/ #!0)# 2'%! 3//4 5,6 %%)(2( 7 '8'.1 (! )- #+! )), # )2 # '((9('%:6 %%)(2( 7 '8'! ;'<*= 02*= 0'*> 0!+". !+# + 3 +$4* 5*3/0 $?# ;%;BCB *DAAAAAAA9AAAA< EEEEEEEEEEE EEEEEEEEEEEEEE0 $?# & ;%;BCB *DAAAAAAA9AAAAEEEEEEEEEEEE EEEEEEEEEEEEEE0 '!-+ +! (<7 8' ' %<(<'< *1< (0 '<'*< 0 6!!!++! */0< < '8 ')6G ' %( F H 0 5I9 J % % )G 6 $;;>/-=K/+->3+33= 4 <J L;;; &< < '<%)<! '(( ( (%<M- & ' )%'' F9)(< 4)' # ''('! !0#!-/ ' :/*&& " 0! ; <! ( ( ( <! "!= =" "
GUIDE TO THE COMPANY VISIT/SECOND INTERVIEW Most companies recruiting on college campuses include a company visit as a part of the hiring process, after the initial screening interview has taken place. There is much more, but you will have to come and find it for yourself. We are waiting for you. Deusto University of Deusto Summer 2011 Study Spanish in Bilbao Bilbao CIDE, University of Deusto, 2011 Welcome to Spain, a country of contrasts, a mixture of languages and cultures, of tradition and modernity. 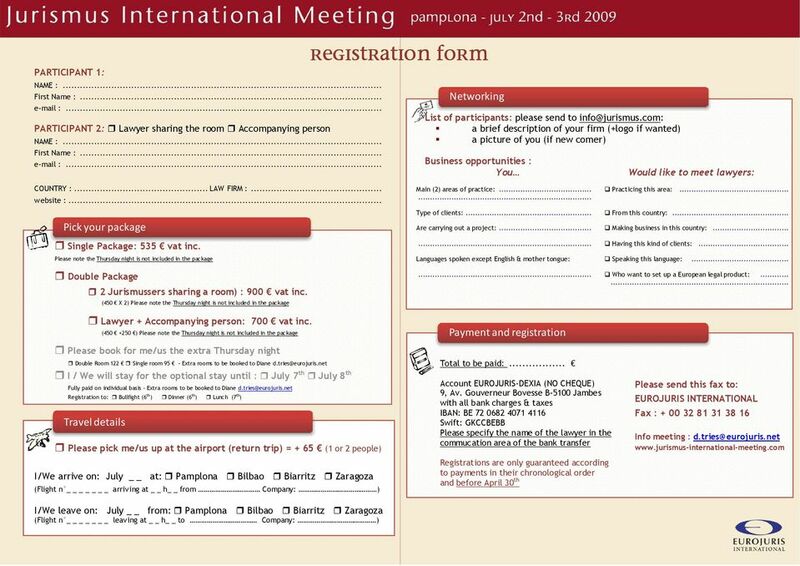 World Summit of Legislators 2014 Mexico City, June 6 th -8 th Key information for Delegates Registration The online Registration form for the World Summit of Legislators 2014 is now accessible on www.globeinternational.org. Please check with the College Office or a member of the JCR Freshers Committee (for JCR events) if you have any questions. TOUR PLANNING. 12.3.3 Access information and develop a tour plan to match different tourist profiles. International. your best international experience for learning business MBA. Foro Europeo. Live it!